In today’s culture, popular music is a vital site where ideas about gender and sexuality are imagined and disseminated. 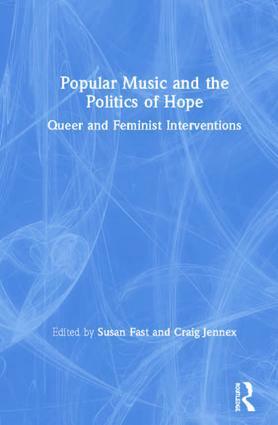 Popular Music and the Politics of Hope: Queer and Feminist Interventions explores what that means with a wide-ranging collection of chapters that consider the many ways in which contemporary pop music performances of gender and sexuality are politically engaged and even radical. With analyses rooted in feminist and queer thought, contributors explore music from different genres and locations, including Beyoncé’s Lemonade, A Tribe Called Red’s We Are the Halluci Nation, and celebrations of Vera Lynn’s 100th Birthday. At a bleak moment in global politics, this collection focuses on the concept of critical hope: the chapters consider making and consuming popular music as activities that encourage individuals to imagine and work toward a better, more just world. Addressing race, class, aging, disability, and colonialism along with gender and sexuality, the authors articulate the diverse ways popular music can contribute to the collective political projects of queerness and feminism. With voices from senior and emerging scholars, this volume offers a snapshot of today’s queer and feminist scholarship on popular music that is an essential read for students and scholars of music and cultural studies. Susan Fast is Professor in the Department of English and Cultural Studies and Director of the Graduate Program in Gender Studies & Feminist Research at McMaster University. She is co-editor of Music, Politics, and Violence (2012), and author of Michael Jackson’s Dangerous (2014) and In the Houses of the Holy: Led Zeppelin and the Power of Rock Music (2001). Craig Jennex is Assistant Professor in the Department of English at Ryerson University. His work is published in Popular Music and Society, GUTS: Canadian Feminist Magazine, and TOPIA: Canadian Journal of Cultural Studies.